It's Saturday so time for a dog song from Talking Dogs. Today's song is a very special one to all of us at For Love of a Dog. You see, as you read this, Tucker, the original Talking Dog, is in the arms of the angels. 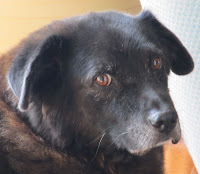 I promise to write more about Tucker and celebrate his 14 years of life with us, but not right now. Forgive me for this short post; my grief is too fresh to bark a lot today. Today's song is In the Arms of the Angels sung by Sarah McLachlan and it is accompanied by lovely Rainbow Bridge art, as well as The Rainbow Bridge Poem. Grab a dog. Grab a box of tissues. Sit. Stay. Please think a good thought for our Tucker and all your own canine friends who will greet you at the Rainbow Bridge. When you've mopped up your tears and blown your nose, scroll down below the dog song video to browse some brilliant dog blogs because today is a Pet Blogger Hop. I'm so sorry to hear about Tucker. We are sending hugs your way. Love this post....read my post about Friends in Heaven. Goodbyes are so difficult! I used to love that song, but after it was used to show pics of animal abuse and neglect in an attempt to garner donations, I can't listen to it anymore. That is one of my Human's most favorite songs. Thanks so very much to all of you who expressed your sympathy. It means so much! I thought a lot about the song I featured in this post - because I flip the channel when the animal rescue commercial that features it comes on. (Just can't take it!) However, I love the song and it felt so incredibly right. At any rate... thank you woofs and hugs to all of you, too! I'm so very sorry for your loss. You have picked a beautiful song for your memorial. May "flights of angels sing thee to thy rest", Tucker.